Expected D-X vs. Brothers of Destruction tag match confirmed. 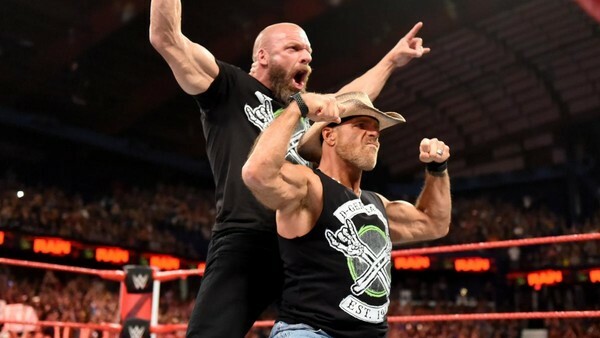 Perhaps the greatest send-off in the history of this great sport was metaphorically p*ssed all over last night when Shawn Michaels confirmed his expected decision to banter off his retirement in exchange for oodles of problematic Saudi Arabian petrodollars. This Saturday's Super Show-Down concluded with The Undertaker and Kane dissing Triple H and Shawn Michaels by nastily beating the young whippersnappers down in the wake of the Phenom's defeat. Last night on Raw, a disgruntled HBK was looking for reparation. He lied that he had stuck to his retirement vow for the better part of the last decade out of respect for his WrestleMania XXVI opponent, only for that respect to turn out not to be mutual. Apparently, that left Shawn with no choice but to return to the ring. It had absolutely nothing to do with a truckfull of cash turning up to his San Antonio ranch. Triple H emphasised the gravity of the moment with a catch-phrase, 'wittily' asking his D-Generation X stablemate "are you ready? ", before handing him a brand new DX shirt. They must have designed it on the plane back from Melbourne. The disgrace that is WWE Crown Jewel is scheduled for 2 November in Riyadh.